Didn’t we have a loverly time the evening we spent at record club? It was great to see some new faces down there, and, of course, the familiar ones as well. We built the night based on the suggestions we’d recieved on our nominate page. These included a bit of psychedelic space rock from Gong (a very well played version of the record was supplied by Paul, a gift from “Bagnall”…), some late-eighties indy pop foolery from the Pixies, a tribute to REM in the form of Fables of the Reconstruction, and just ‘cos it’s 20yrs old we ended with Nevermind. The twittersphere was alive to the sound of Record Club last night, check@therecordclub on twitter for more. Or read our blog. And, don’t just take our word for it, read the Culture Vulture review. A popular suggestion in our nominate section. We played a much loved, muched played version, so there were a few crackles, but it was an interesting listen. As R.E.M anounced they were splitting up just days before Record Club, the punters took matters into their own hands (and why not!) and turned up armed with their R.E.M vinyl. A quick round of UN style diplomacy led us to give Fables of the Reconstruction an airing. Arguably, a little less well known than much of thier work, as it was only their third album, it was an interesting listen. Well there was just a little bit of hype around this album during September 2011, as it became 20 years old. Rather than invest in the 4CD/DVD collectors edition box set, why not have a listen to it on vinyl instead? It was chosen as a late addition to the September event and got squeezed in as a bonus 4th album on the night. The first full length album by the Pixies got the vote over Doolittle on the night of the Record Club event. The whole of their back catalogue was on offer, thanks to Rob who brought it along. This is an album that many people ended up getting on CD as it came bundled with another record, Come on Pilgrim, at the time. So we put the theory to the test that the vinyl sounds much better than the CD versions. 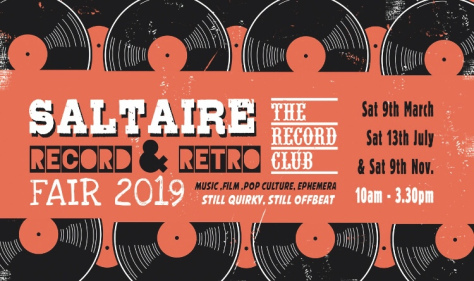 The first ever proper Bradford Record Club was curated by our very own Stu at theThe Kirkgate Centre, Shipley. Check out the event photos. Longtime member of Quack Quack and vinyl aficionado, he chose Horses by Patti Smith and the debut album by Captain Beefheart & his Magic Band. Unfortunately he didn’t manage to track down Safe as Milk on vinyl so he subbed it on the night withClear Spot. Previously Stu had brought a selection of records to our first informal gathering of Record Club, and we all loved what we heard. The third album on the night was chosen via an online vote, with Rock N Roll with the Modern Lovers coming out as the winner. In between the albums, Daz managed to spin a few 7″ singles. Most importantly, it was a great social occasion, with lots of record talk throughout the evening. The bar had some nice beers (and cake! ), and it was great to meet a bunch of other people that seemed to like what we were doing. Don’t just take my word for it. Check out this blog post: Shipley Record Club – an Evening of Music, Chat and Beer. If you have suggestions for future albums, or curators, or anything else, then let us know via the nominate section, or leave a comment below. When we played this we had at least one Captain Beefheart fan that had made the trip especially to be at the club. As it happens we should have been playing Safe as Milk, but we hadn’t managed to track down a copy in time! For some of us this was the first time we’d listened to a whole Beefheart album. A pre-punk favourite from Stu. Interesting to note that this was out 2 years before the punk explosion in the UK. Jonathan Richman and the Modern Lovers were a big inspiration on Punk music – simple short songs played and sung with more enthusiasm than spot-on precision, particularly where Richman’s highly idiosyncratic voice is concerned. Jonathan Richman famously appeared as the wandering minstrel in the film ‘There’s Something About Mary’. Their most famous song ‘Roadrunner’ is not on this album. Rather than the heavier electric sound of their first album (“The Modern Lovers”, 1976), this album features an all acoustic ‘skiffle’ type line-up and the natural ‘live’ sound of the group playing together in a room. The cover art comprises a photograph on one side and a near-identical painting on the other, which are – at first – hard to tell apart. This disc was greatly enjoyed by the assembled few! With our partners off out to a 50’s event at the National Media Museum we had a little impromptu record club, and since we were left holding the baby, used that as the theme. Surprisingly few Dylan fans in the room, so this was chosen as a gentle introduction for non-believers. This is a box set that Dave picked up in his early 20’s, discovering the joy of the ‘wall of sound’. Just a great album. Started the debate about double albums and box sets, so we only played one of the two discs. An album to introduce others to the magic of Captain Beefheart? Dave, Daz, Stu and Linda got together to try out Record Club tonight. Lucy andNicky came by later. Stu brought a selection of records and between us we first selected the Modern Lovers, and then Pit er Pat. It was great. We decided that talking while the records were on was ok, cos we hardly get to see each other anyway. Pit er Pat are a three piece ‘avant rock’ group from Chicago, whose music often has a dark undertone but (in Stuart’s opinion) is never dirge-ish. This album has a refreshing guitar-free rock sound, with interesting rhythms, great keyboard sounds, well-used samples and excellent spine-tingling vocals. Stuart became aware of Pit er Pat when his band played a gig with them in Nottingham a few years ago.